65 per cent of drivers say they regularly get dazzled by oncoming headlights even though they are dipped, according to new research by the RAC. 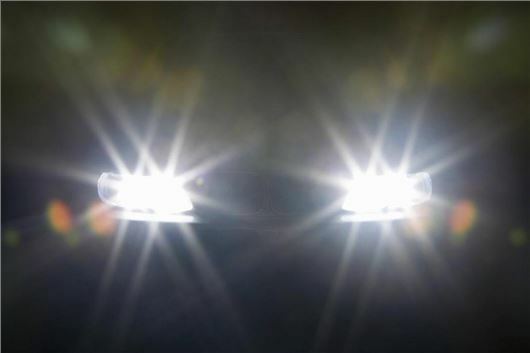 The headlights of some newer cars are so bright that they're causing a safety hazard for drivers, with 15 per cent of motorists claiming they have suffered a near-miss as a result of being dazzled. A range of different types of headlights are fitted to vehicles in the UK, from traditional halogen headlamps to the brighter, newer xenon. High intensity discharge (HID) lights and LED headlights, which are said to produce a light more similar to daylight that's less likely to dazzle drivers, are also used. The RAC survery of 2061 drivers found that six in ten drivers think modern vehicle headlights are so bright they risk causing other motorists to have accidents. Of those who claimed to regularly get dazzled by oncoming dipped headlights, the majority felt it takes up to five seconds before they can see clearly again. The research comes before the new MoT rules are introduced on 20 May 2018. The changes include a ban on aftermarket HID headlamps, with owners required to convert their HID headlamps back to halogen. A driver recovering from being dazzled by headlights for five seconds, while driving at 60mph, would cover a distance of 134 metres - which is more than the length of a football pitch. Among those who think modern car headlights are too bright, half said they get dazzled by headlights in their rear view mirror. This has led to 62 per cent constantly having to click their mirrors up and down to avoid being dazzled, with 21 per cent relying on their wing mirrors more. Seven in ten drivers admitted to finding it difficult to see whether or not some approaching vehicles had their indicators on due to the brightness of the headlights. All cars sold for road use in the UK have to be fitted with headlights that conform to standards set by the EU in line with the United Nations' World Forum for Harmonization of Vehicle Regulations. The UN's Working Party on Lighting and Light-Signalling is currently looking at the issue of headlight glare in response to public concerns. I do have the benefit of not having to wear glasses or lenses for driving and I actually prefer the new lighting technologies with their bright blue/white projections. Oncoming (dipped beam) dazzle has never been a problem for me in 51 years of driving. My solution is to look through & passed the oncoming lights rather than directly at the them. That way I find there is no 'recovery time' necessary. I have friends who wear glasses for driving and a couple of them have said that they find the new lights disturbing so I have every sympathy with those drivers experiencing difficulties. All fine & well until you take a corner on a dark country lane, to be met with a tall SUV type vehicle with high intensity lights that can be seen on the moon! I agree and whilst I also try to look PAST the light source it is not always possible. The problem I feel is accentuated by the increase in the proportion of SUVs now in vogue. This is becoming a serious problem i hope they get it sorted before next winter ! Ditto 42 years/specs not required for driving and taught myself to look through to the road ahead; not at headlights! However, I do believe there is a serious emergent 'dazzle' problem, a problem that should at the very least be quickly reviewed and addressed. In simple laymans terms, the brighter the oncoming light the more you're eyes close down and the ability to see pedestrians, cyclists et'al is greatly deminished. In effect in certain common situations a significant 'blind spot' occurs. For example: immediately behind an oncoming car when stationary about to turn 'across' you. Additional to this other obvious negative factors not least of which being misalligned beams, dirty screen inside and out etc are all further compounded. A few years ago I recall one of the so called premium German car manufacturers terse, if not plain arrogant response and dismissal of such 'bright lights' concerns railed against them. I hope in the meantime that such crass and irresponsible attitudes have now been brought to task? An ideal job for the army of eu buracrats if ever there was, although 'quickly reviewed' would perhaps be an alien concept! Finally, I would not personally recommend those 'cheap' yellow tinted night driving specs. Any additional layer between eye and subject at night (in addition to your windscreenof course) is essentially not a good idea. I would only add that if such specs had absolute top optical quality lenses (to any precise prescrition requirements) they might be worth a try? Total unregulated madness. Some of these lights are far too bright, but worse still some are either unnecessary or prone to problems. The corning lights that make use of front fog lights are totally unnecessary and distract from the indicators in manoeuvres. The Kia Sportage or Hyundai x?? system that continually adjust the main beams and make it seem as you are being followed by someone driving over road humps should be investigated. Glad it was not only me suffering being dazzled whether you look to the side of through these lights should be banned. I know it's not correct but I do feel like giving the oncoming cars a LITTLE flash to let them know they are dazzling oncoming cars. Also the idiot cyclists that fit blinding LED flashing lights idiots. Also what annoys me is that any flashing lights on the TV you are given warnings for people suffering epilepsy. Cyclists don't give a 'fig'. It is so bad for me now , I can no longer drive a night on unlit streets and motorways. Not only are new headlights designed and fitted without due consideration for the safety of other road users, but front indicator lights on many cars are invisible due to their location and lack of brightness. When will car designers and manufacturers learn that their cars need to be safe, not only for the occupants but for other road users. How about starting a list of all the cars that " Dazzle", that may make someone engage their brain and do something! For me the biggest problem is not so much how bright the lights are, but the position of them. Traditional car headlights are significantly closer to the road than those of SUV style vehicles which are more prone to shine straight into my line of vision rather than below it. Having indicators inside or inboard of headlamps should be banned. Static orange lights on the side of cars should be banned. Orange should only be allowed for indicators or hazard flashing. You should not be able to have front lights on without the back. I see this all the time and it's insane. Who even comes up with these ideas? I find LEDs very dazzling. I often flash the driver on the assumption that they are not correctly aimed down at the road. I'm surpised it's taken so many years for these issues to come to a head. I have not met any cars that alow headlights without side and tail lights on first, are you confused with fog lights or daytime driving lights. I agree I prefer the days when we had separate headlight, side light and indicator, don't like the combined ones. I personally don't suffer from dazzle from oncoming headlights, but I do sympathize with people who do and totally agree that newer headlights are far too bright on dipped beam. I have more of a problem with the proliferation of street lights, lit up road signs and traffic lights that are present in built up areas. Totally agree that modern headlights are too bright. Plus lots of vehicles headlights are not properly adjusted, some pointing at the moon. These people are committing offences so where are the Police. It would be interesting to learn how many prosecutions there are for such offences. The matter is made worse if you live in the country and drive on roads with no pavements. It is difficult to see the edge of the road at the best of times and add to this oncoming bright headlights and perhaps a nice dark night with rain and anything can happen. It's about time the powers that be brought in tougher regulations to deal with this. I worked, for five years, in a Halfords SuperStore 8 years ago. There is more profit and sales value in these bright lights and staff were encouraged to sell up from standard bulbs. I never liked them, and when there was no other member of staff in earshot, I would always talk the customer out of buying the bright bulbs. I'm surprised it has taken so long for this to become a real issue. Very few new vehicles are now fitted with HID headlights (otherwise known as Xenon lights). The problem described in the article is almost certainly the result of the massively increasing use of LEDs in headlights. These are incredibly bright and in my opinion should never have been allowed in headlights until and unless a type can be developed that do not dazzle. I agree that lights have become far too bright and are a menace. In particular older drivers with less than perfect eyesight are ar risk. I would also point out that the brightness of daylight lights make it hard at times to see indicators. I too suffer from the dazzle of these new bulkbs, I try to look through or to the side but often it is not sufficient, I seem to remember reading that it is more difficult with these new bulbs to direct the lights via the lamp reflectors and lamp covers as the light emitted is less easy to curve. I also have a classic car from the 70's with traditional round lenses and it is easy to see where the lamps are pointing and check the direction. Mayb e alittle retro would help, some of the new lights are of a very strange shape whcih I am sure also affects the output. There is also the problem of some drivers using the driving/fog lights and headlights ata the same time even though the visibility is not reduced. One was following me recently and it was dazzling me from behind via the interior lights and the wing mirrors, I was greatly relieved when he turned off and left me in darkness. There is a real need to get some proper controls onto all the lights in the cars not oly the headlamps. As a retired night HGV driver I used to enjoy night driving, I noticed since cars changed to fancy shaped headlights they gave out more glare and stray light, I wish we could goback to round headlights that could be properly aimed at the road. I also find many headlights mounted high up cause problems, they were mounted lower down in older cars. I recently had cataract ops in both eyes and encountered the night time dazzle when I returned to driving,it must be said better than the double vision the cataracts were causing. My solution, which seems effective, are a pair of yellow 'driving glasses' which take the edge of any oncoming headlights, even those on full beam, and most importantly enable me to see anything in front of my car. I am old enough to recall my Dad having a pair of this style of glasses in the 60s, I think endorsed by Paddy Hopkirk of one of the rally stars of the period. Incidentally, the figures quoted (60% of drivers dazzled) suggests that a proportion of that 60% are dazzling others? "Among those who think modern car headlights are too bright, half said they get dazzled by headlights in their rear view mirror." I assumed all cars had rear view mirrors that automatically 'dip' to avoid that, I must have been lucky with my cars. I live in the Lake district and entirely agree with the almost unanimous response of concern. SUV/4WD with these lights come straight at car driver eye level and the safest course is to pull into the side - but many of our roads are virtually single width causing issues of trying to get through or reversing while blinded as 'off-comer ' drivers rarely yield . Additional issues are cased night time cyclists( why do they do this!!).. often coming at you in packs with powerful headlamps and helmet mounted lights- totally unable to 'dip' and at speed they are in danger of serious collision- guess who would be vilified if there is one?! This is indeed a growing problem, many's the time i've flashed an oncoming car assuming it's on full beam, only to receive the retort of a full beam flash which has been like getting caught in a WW2 anti-aircraft searchlight beam! This subject was featured on my local radio this morning and all those who called in were agreeing with everything that's been said here. On the new lights it appears the light disperses more quickly than old type bulbs and this is the cause of the dazzle the oncoming driver experiences. Another problem mentioned was the proximity of indicators being too close to the headlights, so the 'blinking' indicator is then less visible at night. For spectacle wearers there was some advice from an 'expert' commentator that having a UV coating on your prescription specs can assist, but otherwise i would agree with a previous comment about not wearing yellow tinted glasses (often sold as night driving glasses and usually plastic). The only similar thing I had (back in the 1970's) was a pair sold by the AA with coated glass lenses, which did seem to help, but not seen anything similar since then. One wonders what conclusion the UN's Working Party will reach, being cynical it will only cost the motorist more money as you can bet the manufacturers won't be keen to make changes if it affects them in their collective pockets. If I am not mistaken, the law limited the maximum headlight strength to 55 Watts, based on old technology. But since new update technology uses less power, they are much brighter. A 10 watt LED car headlight is far brighter than an old style 55w bulb, so where is the limitations on HID and LED’s?? I guess the law is slow in catching up? I'm no expert, but have a technical background. Yes, the regulations just haven't kept up with technology. 55 watts used to be a - sort of - measure of brightness. It just assumed that any headlight drawing 55 watts would be of a certain brightness. Halogen was the only technology we had - so the brightness was pretty much what we understood. But, a 'watt' is really a unit of energy. Much of the energy was actually converted to heat. The bulbs were blisteringly hot when in use. LEDs are much more efficient. Virtually no heat - so much more energy is available for light output. The regulations should measure Lumens - a unit of 'total visible light'. Although there are many complaints regarding the brightness of modern Xenon or LED headlights, I find an even bigger problem caused by motorists who do not replace a failed bulb resulting in them giving the appearance of a bike. Equally dangerous are diy replacements of headlight bulbs which often leave one light pointing skywards, dazzling all facing it. In theory both situations are illegal but I can’t recall ever hearing of action being taken. 21watts flasher and stop lights and just 5watts for sidelight and marker lights. Surely these new style lamps exceed the brightness in candles /wattage equivalents. do the original rules still apply or has that been slowly exceeded as I'm not updated on newest rules for car manufacturers. Perhaps someone can enlighten on these old rules. It's not just a matter of the blinding lights the drivers of those vehicals tend to go much faster than they normally would or did with older type lamps because they can see much further up the road. Night driving needs and should be slower speeds than in the day time. From the comments above it is obvious there is a serious problem, and it is one that I have been commenting on generally for years, and it needs sorting now. I now wear glasses for driving but it was not any better before, seeing through the lights is ok in theory but when confronted with these lights on anything but a straight road there is a big problem. Years ago there were strict requirements regarding the hight and placement of vehicle lights, that has gone out of the window and in addition to the varied headlights on cars we now have a whole raft of ridiculous brake and turn lights some last seen on an Oldsmobile Rocket 88, fashion has overtaken common sense, time to correct these silly lights. It is a problem that does need sorting. I drive a car, motorcycle and pushbike. I agree with a previous comment regarding suv's that the lights on many of them are set too high and dazzle even on dip. Where we live in Derbyshire we have to put up with many roads that are not fit for purpose and many hills and potholes. Over the brow or slope of the hills can be areal threat to road safety when on coming lights are pointing at the sky. My car has halogen lights and are correctly set and do not dazzle anyone. Motorcyclists can be a nuisance in the daytime when they ride their bikes on full beam and dazzle oncoming traffic, Push bikes can be a pain as well with the led head mounted lights that are more like search lights than see and be sean lights. I have a perfect solution. Don't drive at night. When I first started driving I was told to look towards the kerb when cars came towards me with their headlights on even if dipped, something I have always done in 59 years of driving, but yes nowadays cars coming towards me have badly adjusted beams and this is caused, I read, by the fact that newer cars need to have their lights adjusted when a bulb change has been made and this should be done at a garage with the proper equipment. This unfortunately can cost a couple of hundred pounds and you will always get those that won't pay that amount even though they want these lights. As light beams can be set in daylight perhaps roadside checks can include this. As far as being dazzled is concerned, I don't suffer the 5 second blindness, which may be due to the fact that that since they became available I wear reactolite type lenses in my prescription glasses but these can be purchased for none glasses wearers. The after market HID conversions are right to be banned, it is those and only those that have too much light scatter and can dazzle on coming drivers. Modern lights are exceptionally good and don't dazzle when used properly. It is the lazy and late dipping on cars that have not got automatic headlamp dip that causes a problem with headlamps and I am much more likely to dazzled by the buffoons running with their fog lamps on - because it looks cool. As a senior citizen driver that started with vehicles fitted with tungsten headlamp bulbs and some of them with only 6 volts I am not inclined to complain as the advantages of modern headlamps far outway the disadvantages. The problem is even worse in low sports cars. I have been driving Mazda MX5 s for the past ten years, and whatever type of vehicle is approaching , they all seem to dazzle you . I’m glad I’m not the only one who thinks these new lights are dangerous. I remember when halogen headlights became the norm, replacing older tungsten lights. Driver’s complained that they were too bright. However, halogen lights now seem ‘yellow’ in comparison to the dazzle of modern HID or LED, many of which are higher, due to being fitted to SUVs. I now find driving at night uncomfortable despite having excellent vision, not needing glasses. I knew there was a problem with modern headlights, last summer a Mercedes driver stop me in my tracks with his headlights on full beam, about 10 o’clock in the morning, the glair was so bright, all I saw was a wall white. I had 2 Mazda 6 one was 2005 model and the second one was a 2008 model, I notice the H4 lights gave much more details, against the more modern HID lights, only works well to a point when dash light are turned down low and was looking at white haze, definition made better with my driving glasses. I start to where yellow tinted glasses, because the brightness started to hurt my eyes at tee junction the worse, looking left to pull out, as the beam pattern is to luminate road signs. Question: what damage is the bright lights to road use eyes? I brought my driving glasses from s—-saver, they mentioned the has been increased orders in driving glass. You probably have a mild cataract condition that is rarely diagnosed by hight street opticians and is only a problem when facing bright lights at night. It's easily cured by a minor operation. " Now which is it or are we all suffering with the above or HID? I have LED lighting on my vehicle and very rarely get flashed by other motorists but I am careful to ensure I used dipped beam and try not to dazzle oncoming drivers. Properly set up however these LED lights are a revelation on the road in terms of what you can see and how the road signs seem to be reflective from a lot further away than with standard lighting and as such are a big bonus in terms of road safety by picking up roadside information earlier, high viz jackets reflect better with these new lights and unlit cyclists can be picked up sooner as well. There has to be some balance to this argument as in the round being able to see where you are going better with consideration to other motorists has to be a happy medium. Day time driving lights are far too bright. Drivers of automatics keep their foot on the brake at traffic lights and dazzle others behind them....sooo stupid. They just need to pop into N and apply handbrake or hill control mode. That's what I do. Headlights on all modern cars esp the SUV's too bright. Also idiots wait at lights with their indicator blinking....distracting.....! ...and irritating. Lastly the m****s who drive about with their front fog lights on when there is no fog....and then those who 'forget' their rear fogs(s) are on and if you try and warn them they just ignore you......there is no road manners in the UK any more and most of these drivers seem to lack basic intelligence. Front and rear fog lights should be made to switch off when ignition turned off and not come on when ignition turned back on so if you want them back on you must do it manually, that might stop some who leave them on all the time, with no police patrols there in no one to give them a ticket like the police did years ago. Many higher vehicles do have the headlights mounted too high and hit oncoming drivers in the eyes, there should be an upper height limit like there is a lower height limit, if lower than limit can only be used in fog and falling snow. Night driving is becoming an increasing nightmare. Not only are we blinded by the over-bright lights of SUV's, there are many cars with standard lights that are not adjusted correctly, plus of course those aftermarket HID's which hopefully should start to disappear after the new MOT regs kick in. On-coming vehicles with bright lights are bad enough, but you can look away and they are past quickly. It is those behind that are most annoying. If you are unfortunate enough to be followed by one as you go over the brow of a hill, you are likely to get blinded by direct reflections from your interior mirror and both door mirrors. I doubt these ultra bright lights are going away any time soon, but their antisocial effects on other road users would be reduced if regulations were brought in to limit the height of these lamps above the ground. They should also be required to be checked annually, independent of the MOT. After you have been blinded by other motorists, you then have to devote all your remaining concentration on avoiding the ever increasing number of potholes. I agree that headlights have increased glare in recent years, to the extent that I'm sometimes not sure whether to flash the driver coming towards me because they might have their full beam on. But another worrying development are the intensely bright, flashing, front and rear lights used by cyclists. I've encountered these lights approaching me from the opposite side of the road a few times and the combination of intense light, possibly not adjusted for the angle of dip they should be, and the flashing makes it really difficult to concentrate on the road past the bike (maybe as a result of your eyes trying to momentarily recover as the light flashes). Just wondering how something so dangerous (and selfish) was ever allowed to be deemed legal? Night driving is becoming an increasing nightmare. Not only are we blinded by the over-bright lights of SUV's, there are many cars (and lorries) with standard lights that are not adjusted correctly, plus of course those aftermarket HID's which hopefully should start to disappear after the new MOT regs kick in. On-coming vehicles with bright lights are bad enough, but you can look away and they are past quickly. It is those behind that are most annoying. If you are unfortunate enough to be followed by one as you go over the brow of a hill, you are likely to get blinded by direct reflections of them from your interior mirror and both door mirrors. I doubt these ultra bright lights are going away any time soon, but their antisocial effects on other road users would be reduced if regulations were brought in to limit their height above the ground. They should also be required to be checked annually, independent of the MOT. After you have been blinded by other motorists, you then have to devote all your remaining concentration on avoiding the ever increasing number of potholes. I find that the illuminated strips that "decorate" headlights these days pull your eyes even in daylight, who allowed all this to happen, arnt vehicles tested by the govt to ensure they comply before producing them ? I also find that the headlights of the latest vehicles are far to bright. I am in my 70's and I find it difficult driving at night. My car is a 1998 Honda Accord which is a fairly low car, and I have discovered that some 4x4 vehicles headlights are higher than my bonnet. Is it not time that a maximum height for headlights is introduced ? How can you possible drive a sports car at night ? Totally agree with all of the above. SUVs are the main culprits due to the height of the lights. Cars cresting a hill or bridge are particularly dazzling even on dipped - SUV or not. I should also like to query the automatic dipping lights. Travelling around our country roads here in Derbyshire, cars with full beam on can be seen approaching a bend. I dip mine before the bend. The car coming the other way, presumably with auto-dipping lights, does not until you have got a couple of eyefuls of them. It is logical to presume they do not auto-dip until they can see you. Many of our country roads have soft grass verges and the markings both on the edges and in the centre have totally disappeared. Faced with these headlights, I have had no choice but brake to a crawl. Cyclists are indeed a problem. The one thing I find about these LEDs on bikes is that there is an absence of distance perception. Not my normal everyday car but I do have a 1975 BMW 2002tii with H4 halogen lights. By todays standards these are but mere candles. The strange thing is, I can still see where I am going and never get flashed by anyone. I think that a lot of motorists don't know there is a little rotary switch fitted to most cars that will allow you to raise and lower the dipped beam angle. If you are carrying extra weight or passengers your lights are going to be higher beam angle because of the rear suspension being flexed downwards. If the beam angle is lowered then dazzle is reduced. Net time you park in a car park , locate the switch, and which how much the beams go up and down. Another pet hate of mine is cars parked with headlights on, particularly on the wrong side of the road. I wonder if a lot of drivers think it's the ignition switch controls the headlights?? There ir a light control switch that allows the control.of number of lights. I have recently nearly run over passengers alighting from a car , into the road, when I was completely dazzled by stationary cars with dips on. With so much being done by the car these days I wonder if drivers don't realise how much control they can have over the car!! Make sure you have clean glasses, have been checked for cataracts and your eyes checked regularly AJND make sure the inside of your windscreen is clean. All affect visibility. Being th MD and founder of Powerbulbs.com 20 years ago I agree that in the last five years the alarming results of RAC survey does seems to coincides with the increase in LED headlamps over halogen filament type,. Better light by all means but no more glare or please ! There's no doubt that LED lights give out a huge amount of glare whilst giving out precious little to see by, hence they have to be ludicrously bright to function as headlights. Talk of energy saving is t***, the electricity used is a by-product of having an engine to power your car, so a return to halogen bulbs for headlights is only sensible. On the other hand, LED side lights are a good idea as they are meant to make the car more visible and in this they work well. I don't see why we have to wait for the great bureaucracies to act to ban LED headlights, we'll all have retired by the time they legislate or they'll be on the take and the manufacturers will just reach for the brown envelopes. If people want to sell cars here they should have to conform to what the British government prescribes, and this should be in line with the comments above. The weight of opinion shown is so gratifying, I thought I was the only one who hates LED headlights! I am in my 77 year so 50 of them driving. Yes, the lights today are quite bright. I took the advice of the AA before last winter which was ‘ don’t look at the oncoming lights, look beyond’ and this works. Those claiming they are blinded with 5 seconds recovery are possibly staring at the oncoming traffic. I agree it would be nice if dipped headlights were a little more dipped and traffic kept to the speed limit ! One thing that nobody has mentioned is 'colour temperature'. Ask anybody who reads instruments at night - e.g. astronomers - and they will tell you that REDish light does not destroy your night vision as badly as BLUEish light does. And which end of the spectrum are these glaremonsters??? Car lights in general need looking at again by the regulatory bodies . Headlights too bright or fitted so high that dazzle ,Front Indicator lights mounted between headlight making them less visible at night. Tiny rear indicators designed for style rather than actually indicating. . In fact the it appears that "Style or Fashion " is the main consideration when designing a car and very little thought given to unintended consequences like dazzling other road users or effectiveness . Designers probably get the "Top Gear " team to test new lights ! As already mentioned the popularity of huge SUV type vehicles with headlights fitted at shoulder height doesn't help matters. I thought that head lights even those fitted to HGV's had a maximum height limit to prevent dazzling but that seem to have been scrapped. Drivers especially us older drivers also should have regular eye checks as cataracts can start to impair night vision and even at an early stage cause unacceptable glare and and dazzling , I can speak from experience and once cataracts are removed and clear vision restored the dazzling or glare is greatly reduced. The lenses on modern lights seem to intensify the output and I find that on approaching these vehicles, any undulation in road surface gives the impression of flashing headlights which, as we all know, should only prevail between 23:00 and 07:00 as a warning (instead of the horn) and if they are negotiating the dreaded speed bumps the effect is further intensified. I also bless the day that I bought a car with automatic dimming rear view mirror when being followed. So glad this isn't just me! 65% - wow! Recently I was dazzled by a car coming up the hill towards me and failed to see a pedestrian on my side, walking towards me, until the very last moment - how I missed him and the oncoming car as I swerved I shall never know! Scary moment. On the whole, when the dazzlers are coming towards me I tend to fix my eyes on to the side of the road (a white line here really helps) to keep my car in the correct road position ... and hope! +1 to all the above, personally I've noticed in the last few years all the problems mentioned above. Colour temperature is very important for not hurting the eyes, the current fashion for the whitest light is akin to watching arc welding and feels like it does the same damage. Seeing an old warm headlamp on full beam is like a soothing eye massage compared to these retina searing hids and leds. I'm glad it has now been recognised that hids are a pita and should never have been allowed but it does seem that legislation is required to control these things, lets hope the UK legislators listen to the RAC and the people and do something about this dangerous situation that has been allowed to develop on UK roads. This is something that common sense should put right once we no longer have to abide by European rules. I have found that in addition to LED and HID headlight glare, it appears that the adjustment is not always correct for oncoming traffic, almost as if driving on full beam. This is particularly noticeable on main country roads with a stream of oncoming traffic and the difference in light intensity is enormous. As mentioned by others it is very difficult to look through the glare when there is total darkness around you. Recently I have noticed that indicator lights at the front of vehicles are very close to the driving lights and with the high intensity of the lights ‘hide’ the indicators. Very recently I was following a car in daylight, the stoplights came on and by the vehicles position it was going to turn to the right, but because the rear indicator was positioned within the stop light it was not noticeable due to the intensity of the stop light until I was close to the vehicle. I know there are rulings on the spacing and height of lights on vehicles but perhaps the ruling bodies should be looking closer at modifying the rules. Have to agree with most of above. Simply, yes, they ARE too bright!. The DLR's on some cars are so bright as to be ridiculous and it isnt limited to say Mercedes either. With the trend to build indicators around these, sometimes you cannot see the indicator is active at all. Thankfully more manufacturers are starting to dim the DLR or headlight as they flash. As for Audi's scrolling indicator, these should be banned outright. Regarding the drivers with cataracts, you know that you should NOT be driving and certainly not at night. I've had my cataracts removed years ago and I know that you cannot see that well to drive safely. And I don't like the new types of lights. Worse still, are the new absolutely blinding red and blue lights, on top of police cars. They are searingly bright and painful. Even causing a nauseous feeling with myself. They in themselves, could cause an accident. Even when driving past me, these blue and red lights blind and cause eye pain. When the police car is static, you have to almost close your eyes even from 100 yards. What idiot thought these were a good idea. Yes you can see them for miles but they act like laser beams to the eyes. Action needs to be taken before they cause an accident. Why weren't they properly evaluated? Being much brighter to the point of blinding everyone is plain nuts and not an improvement. I agree completely with the comments about the blinding problems with HID and LED headlights. But I also find that even traditional headlights present a similar problem when used illegally with foglamps when visibility is more than 100 metres. Also, many vehicles are now fitted with headlamp height adjusters to compensate for the load; how many are bothering to adjust them when carrying more than two people and a few things in the boot? I dont necessarily agree with the cataract comments. I was initially diagnosed by an Optometrist with cataracts about 6 years ago followed by annual check-ups. I had the operations a few months ago which were successful and find no change whatsoever in my distance vision, though I still need spectacles for reading. When you have cataracts it's like looking through a net curtain, this gets worse and worse and at night time you cannot see very well.